and you shall find it is only that which has given you sorrow that is giving you joy. Today it is about Allegria Eau de Parfum, the Joy (in Italian) by Rouge Bunny Rouge. A fragrance which lifts my spirit as much as the joy of the nature in Spring. I have been exploring Rouge Bunny Rouge perfume line through their perfume testers. Since I don't have a counter close by, this is the best way to experience them. The perfume testers can be ordered from Rouge Bunny Rouge Online Boutique (not affiliated), sometimes they are also offered as gift with purchase. There are two perfume collections, Fragrant Confections for her and a darker more intense unisex line called Provenance Tails. With the latest additions to their line, Rouge Bunny Rouge now offers 6 Perfumes in Provenance Tails line as well is eight creations for Fragrant Confections. I find this chart which they have posted on their blog very helpful to get introduced to the line. On the chart you can also find the names of the noses behind the fragrances. 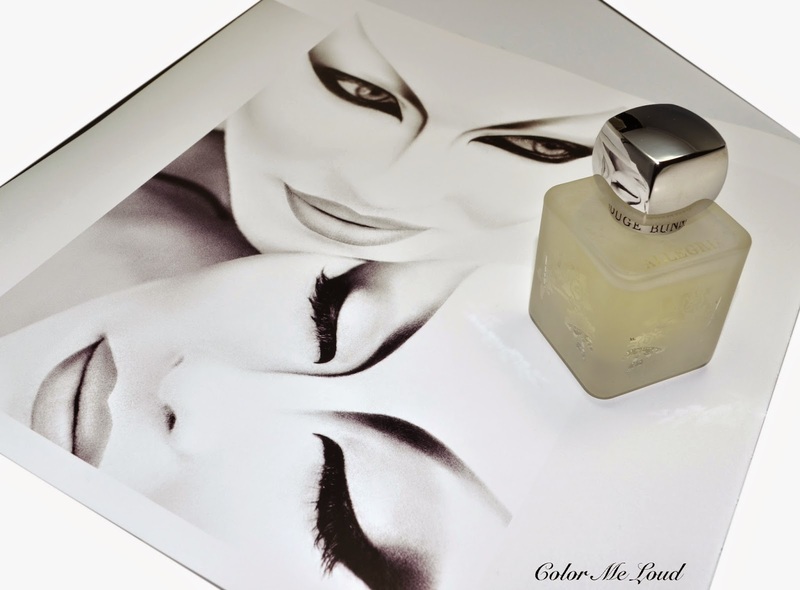 If you are a perfume enthusiast, you will be delighted to see some very familiar names. 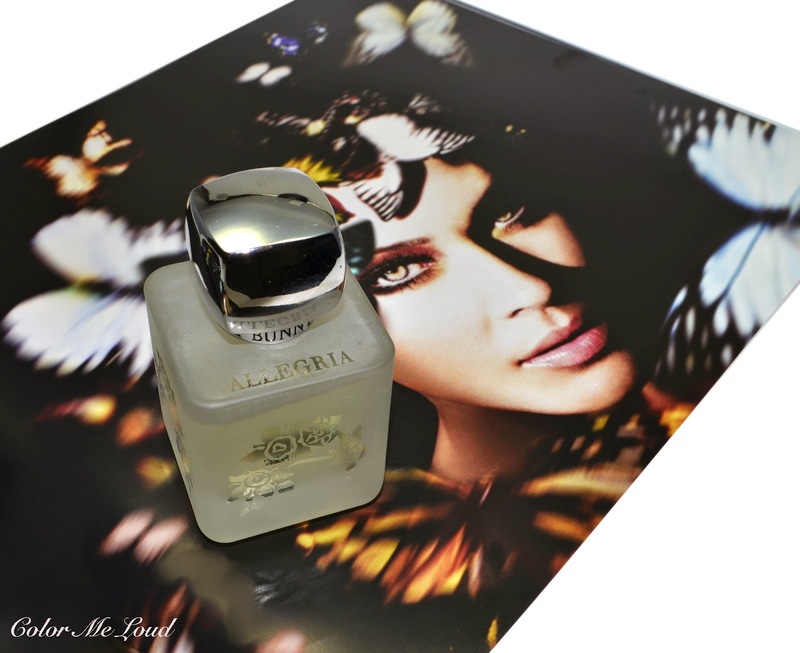 For me Rouge Bunny Rouge Allegria Eau de Parfum is a transition scent from winter to Spring. I have waited for the right moment to review it and today, with a wonderful sunny weather and generous temperatures outside, I have heard some colleagues commenting cheerfully "Spring has come!". I personally think it is too early to say that. It is a little "Allegria" though which lifts the spirit up and make me long for the upcoming season. To me this is what this scent is about. The fragrance pyramid for Allegria is provided at brand's website as follows. Mint Nanah and Tonka Bean are marked as natural Orpur, denoting natural ingredients of exceptional purity. Allegria open with a unique citrus kick. During first whiffs, Grapefruit dominates, give it a bitter quality which sets it apart from common citrus openings. I have a love hate relationship with Grapefruit. It is one which invites me by its smell but once eaten, too bitter for my taste. This deceptive but seductive quality lingers while the sweet notes of black currant, spicy green nature of mint and basil appear. Freshness of the opening is now taken over by eucalyptus and mint. It is a duality of spice and freshness, just a little sweet and very seductive. Soon enough spicy bitter green portrait starts warming up as its woody and musky character reveals. Dry down is powdery and a little sweeter than its opening thanks to the lovely tonka bean accord, rounding up the amber wood and musk with its intoxicating nature. Allegria lasts five to six hours on me and stays close to skin for another four hours. With its moderate sillage and it is a pleasant but unique scent, it can be worn for the day and to the office. I find it particularly nice on a warm winter day or a rainy spring weather. After all it brings the duality of bitter grapefruit and sweet tonka bean, just like the game of sorrow and joy of Kahlil Gibran. Final thoughts: Rouge Bunny Rouge perfume collection pleases those who are after unique niche fragrances. Allegria is an office friendly but not boring perfume bearing a lovely balance of green, sweet, spicy and woody. What is your favorite Winter to Spring fragrance? :-) I can totally understand. I also usually wear what I feel like in the morning. Some times I am in floral mood, sometimes in woody mood lol. I have some samples of the other fragrances in the line, they are all very unique. I would recommend that you get a few samples first to try out what you would like. I am assuming of course that you don't have a counter near by. Oh you have made me intrigued enough to want to order the tester vials too!!! Been eyeing these for a long time but i never knew where to start! As for grapefruit.... i'm totally with you!! That pretty pink color, that sweet smell.... and then that bitterness! BUT, recently i discovered a taiwanese special breed of grapefruit / pomegranite (they're the same family)... these are just slightly larger than an orange and pear-shaped.... there is no bitterness, and it is sweet all the way!!! I had an awful craving for them during my pregnancy 3 years ago and bought a carton full of them! LOL! Oh that taiwanese grape fruit sounds so awesome. If I come, promise me we will find these for me to try lol. That sounds great, and this bottle is so cute, I like it. Bottle is very nice, it is a vintage design, love it. Ich würde auch sehr gerne an eine RBR Counter. Ich denke vielleicht während mein USA Reise dieses Jahr, kann ich eine finden. Wenn man mit die Produkte spielen kann, ist ja viel attraktiver. Fuer Parfüme brauche ich aber trotzdem Tester bevor ich mich entscheide. Is there anything RBR can't do beautifully? This sounds like something I would love very much, thanks for introducing me to it! I don't think I have a preferred winter-spring fragrance, but it's likely I'll want something fresher, light and maybe more floral than the deep woodier spices I love for the colder weather. If you end up getting it or a tester, let me know how you find it. I also started reaching for lighter florals and fresher fragrances already, although it is still cold here.